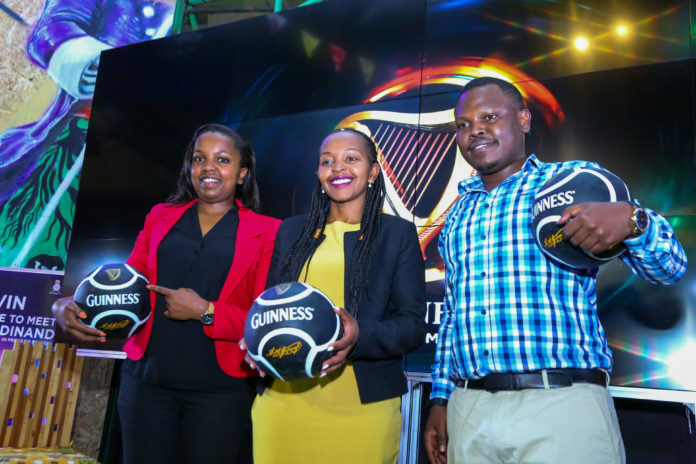 Kenya Breweries Limited (KBL) Brand Manager Christine Kariuki, Marketing Manager – Guinness, Nduku Wamakau (middle) and Shopper Manager Kennedy Mutula (right) during the announcement of a partnership with legendary English Premier League football legend, Rio Ferdinand. The legend will be visiting the country later in the year courtesy of Guinness Meet Rio Ferdinand National Consumer Promotion. As part of the activities, the former Red Devil’s centre back will visit Kenya with Guinness later this year, where he will spend time meeting and interacting with football fans who have shown they go the extra mile when it comes to demonstrating their passion for the beautiful game. The ‘Guinness Meet Rio Ferdinand’ national consumer promotion will offer lucky consumers a chance to interact with the legend during his visit.